We chat to Josh Handley, David Street and Mark Evans-Leigh about everything Priscilla! The Players Theatre Company have been putting on shows for almost 20 years, firstly at Southend’s New Empire Theatre and then more recently at Westcliff’s Palace Theatre, but their next production is a show so big, they have had to take a road trip, through the outback - ok, the A127 - to Basildon’s Towngate Theatre, for the regional premiere of Priscilla Queen of the Desert. The show features a 32 foot revolving bus, a professional Orchestra, West End scenery and over 150 wild and wonderful costumes including more than 50 wigs. “Without doubt it’s the biggest show we have tackled, since staging the Premiere of Disney’s Beauty and The Beast, back in 2010” said the shows director, and producer of the company, Julie Robertson, “and even then this show trumps it in the sheer volume of costumes”. Josh, right, clearly wondering when David (centre) and Mark (left) are going to lend him their heels! 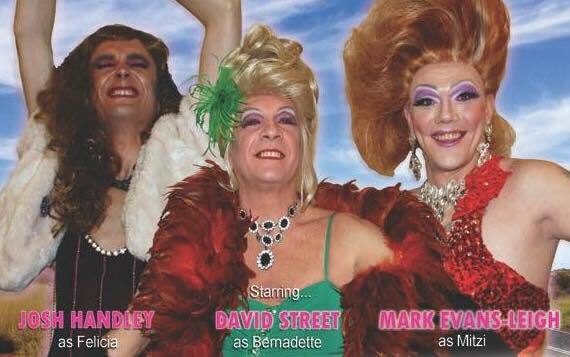 In real life, David, 54 and Mark, 34, (who play Bernadette and Mitzi in the show) have themselves performed in their own individual drag acts and certainly have no trouble working their way around false eyelashes, wigs and stiletto heels; something that Josh Handley, 23, who plays the youngest of the three drag queens, Felicia, has actually taken to surprisingly rather well, having never done anything like this before. Priscilla was first staged as a musical in Australia, and soon found itself heading for the West End, and Broadway. It has been professionally staged in over 40 productions, and now the Players Theatre Company are amongst the first in the UK to have the honour of staging this show. Mark remembers watching the film of Priscilla Queen of the Desert when he was a 15 year old boy at the height of his sexual awakening. However, there is a moment in the show which particularly resonates for Mark. David currently lives with his husband in rural Kent. “We’re probably the only gays in the village,” he laughs. “I moved in five years ago and I’ve never changed and I’m not going to change. And now everyone accepts us.” He continues, “Nowadays, I don’t think there's as much stigma about being gay. Nobody should be saying, I can’t go and do this anymore. Anybody can do anything." David believes Priscilla has something for everyone and will appeal to a broad spectrum. The show features many of the songs people loved from the film, like Shake your Groove Thing, I Will Survive, A Fine Romance and Finally, but it also has other classics thrown in for good measure like It’s Raining Men and True Colours so it promises to have something for everyone, and have you on your feet at the end. ​The show runs from Wednesday 27th to Saturday 30th June at the Towngate Theatre Basildon, but be quick as tickets are selling fast.